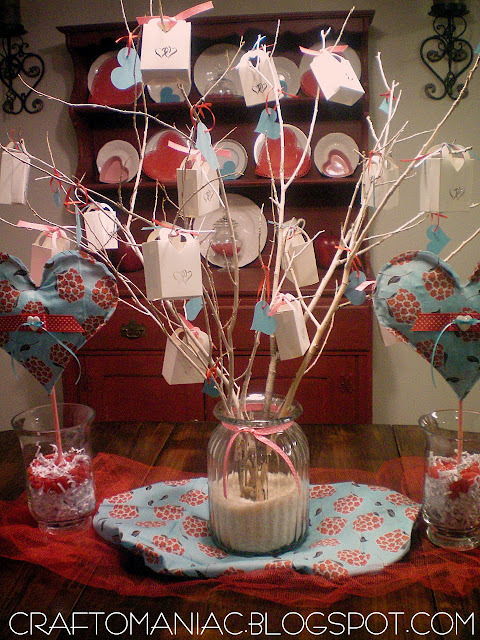 I made this VALENTINE ADVENT Tree for my kids yesterday. 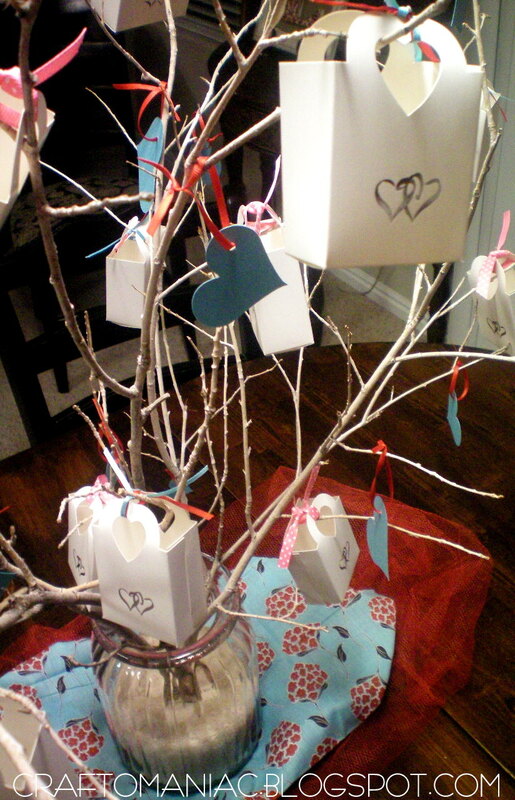 There are “14” heart boxes on the tree tied with ribbon. At the end of Jan. I will fill them each with 3 different v-day treats and some with sweet love notes to my kiddos. 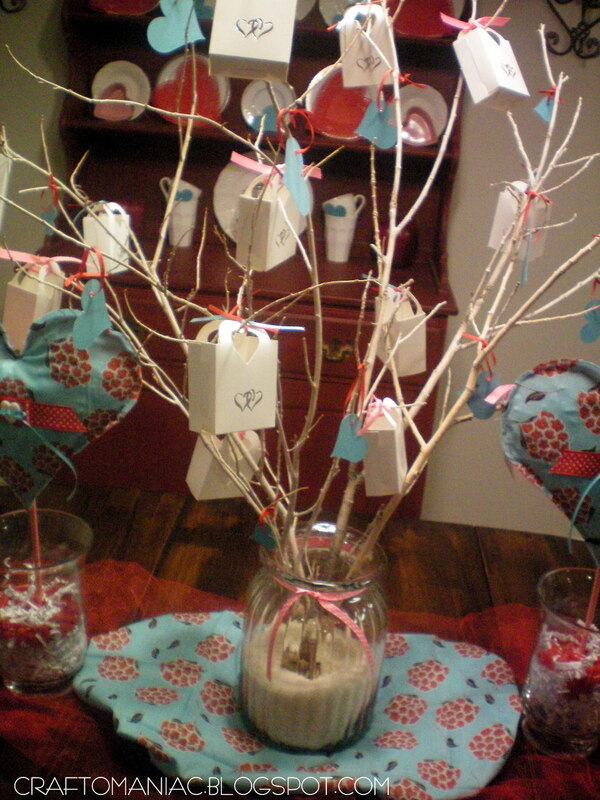 They all will get to count down the “14” days until love day by removing a box off the tree and seeing whats inside for each of them. Believe it or not my 9 year old sons two favorite holiday’s are Christmas and Valentines. I asked him why V-day? 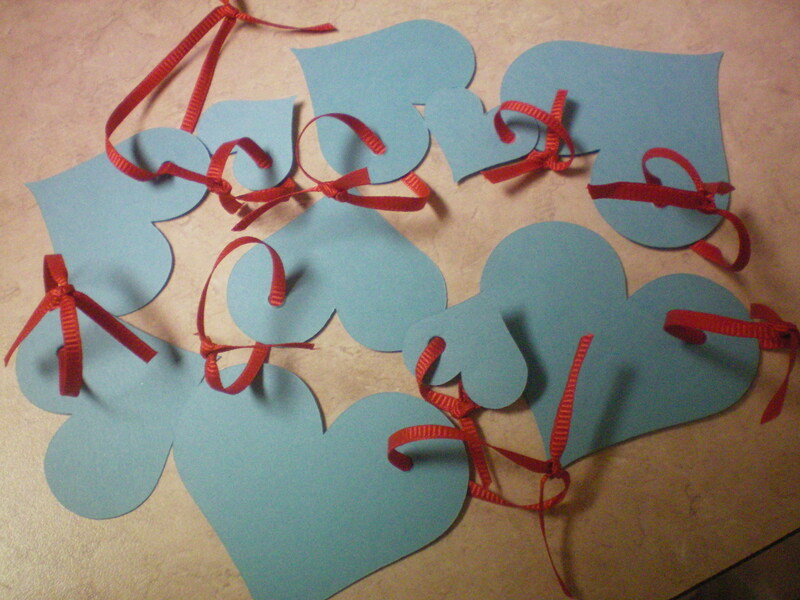 he said “because everyone is in love and you get alot of Valentines!” LOVE THAT BOY! for now the tree sits pretty on my table. P.S. I think I may be over doing it here on CraftOManiac with the V-DAY Crafts I won’t show any until mid-next week… HA! So I got the little heart “favor” boxes in the wedding section at Roberts Crafts. So I had this idea last year, but never got around to it, so I have been super anxious to do it this year. The favor boxes come with 24 for $9.99 and then I used my 40% off coupon. I grabbed one extra roll of ribbon and the rest of the stuff I had at home. The tree is some old branches I tore off of an old dead tree in the desert. RECYCLE! HA! 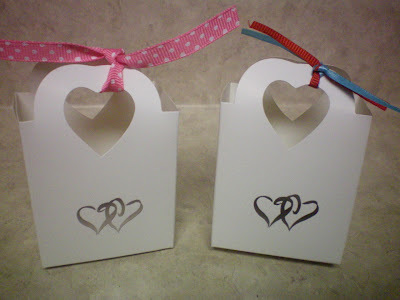 and here are the boxes made with tied ribbon. 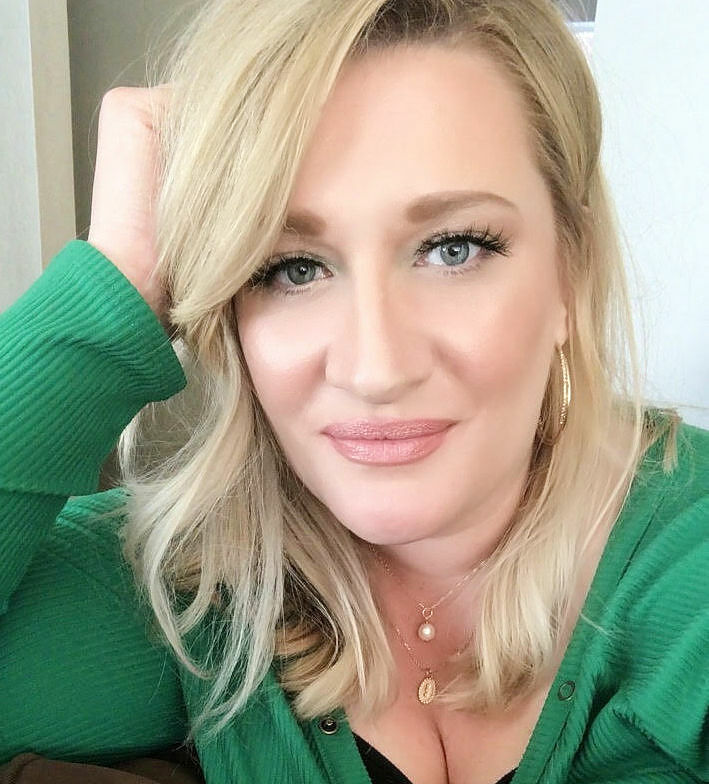 I am adding this new teal like blue to my decor this year, and I am loving it. even though the tree looked cute with the treat boxes, it needed more. 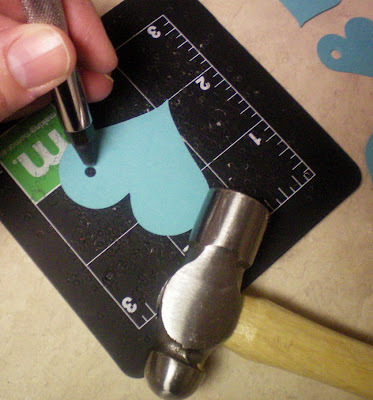 So I cut out different size hearts from my Cricut using the “Platinum Schoolbook” cartridge. 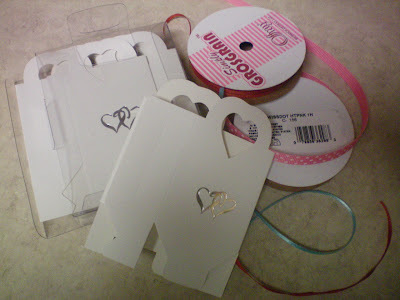 I hammered holes in each one to thread ribbon through to tie in knots and hang on the tree. THEN I spaced out the hanging goodies and placed them and re-moved and re-placed them and had fun decorating it! I wanted you all to see it next to my Heart Topiary’s. I still think I will put the Topiary’s on my entry table. I need to break up the blue throughout the house. 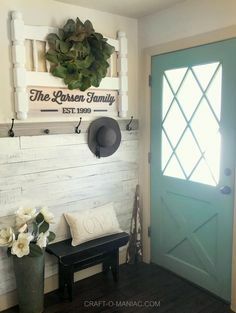 I am linking up with A Glimpse Inside for Catch a Glimpse HERE Show and Tell Friday at My Romantic Home HERE and BoogieBoard Cottage for Master Piece Monday HERE. Cute lil tree I love the idea. I love this idea! I am going to “steal” that idea and make one for my little girl! Thanks for sharing! That’s so cute! I bet they love it! Thanks for linking it up Jen! Happy New Year! I love your tree and everything about your cute things! Thanks for sharing..really inspiring :o) Super cute! Very cute! I’m just taking down Christmas stuff today and was looking at my advent calendar thinking how I’d like to make it into a V-day countdown calendar! So fun to see I’m not the only one! I just sort of skip right over New Years. ha! First time I’ve seen your blog. Very cute! Coming from Glimpse Inside party and just became a follower. I love that tree! Looks amazing! I love to decorate with tree limbs, at Christmas I put some in a tall glass milk pitcher and hung glass icicles from them. I love your blog! I love valntines day this is out of control and right up my alley! So glad to find someone else with a craft disorder! I love this look. So neat, I am so looking forward to making items like this once I have some kids around. 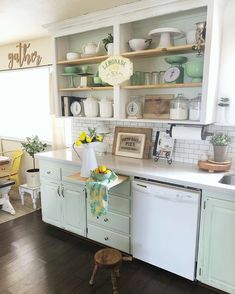 What really also caught my idea was the hutch in the background…super adorable. 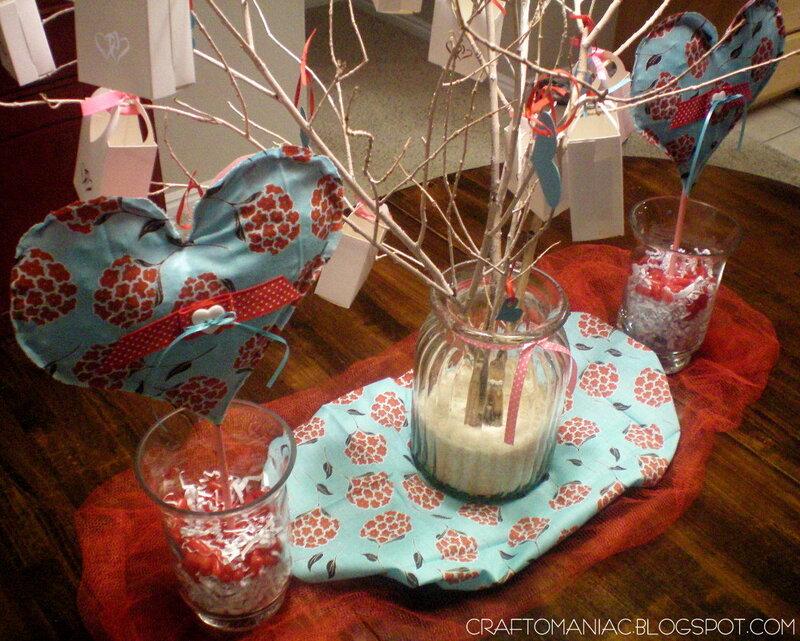 Where did you get your hands on those heart shaped containers, I really like the clean-cuttness(I know not a real word) of them along with the colors. This tree is so adorable! What a great idea. Also congratulations on the upcoming one year anniversary of your blog. That’s awesome! That’s way cute! Love your idea! Darling Darling Darling!! It’s so cute and Festive!! Uau, I love it! Happy New Year for you and your family! Hi, I found your blog at My Romatic Home. 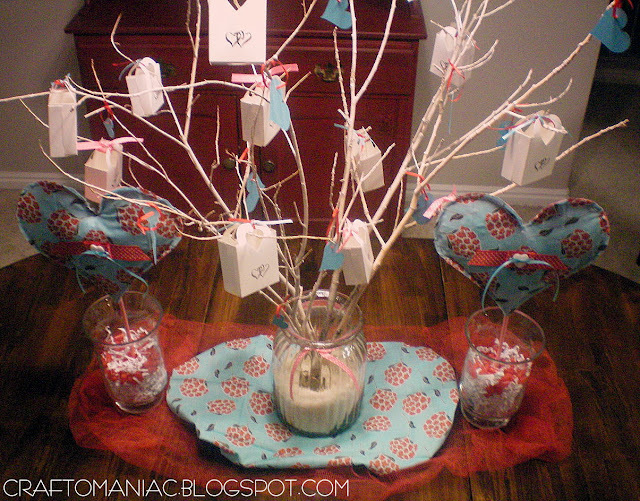 I love your Valentines advent tree, too cute! I would like to invite you to post this over at my new link party, Masterpiece Monday, at my blog, Boogieboard Cottage. The link is already up. I hope you can join the party! Great idea!!! 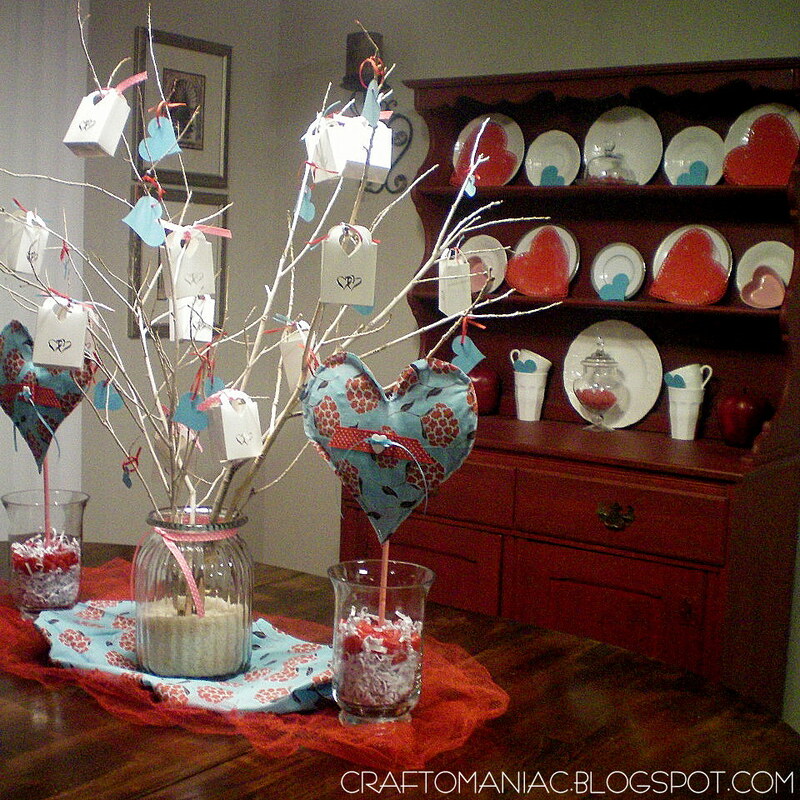 And I love how you added blue to your Valentine decor. I may have to give that a try as well this year. Still haven’t decided which direction I’m going for Valentine’s Day. Heck, my Christmas decor is still up. What a great idea! You have inspired me to head to the storage building to pull out my Valentines decor! I also linked up to CWTS. 🙂 I have that fabric… it’s super cute in your tablescape! Darling idea! This is such an adorable idea! My kids would love it! Thank you for stopping by and leaving a comment, it means so much! I’m a follower of yours, I enjoy your weekly creations!